Offering the area's only Adults only cliff top Touring Park, affording panoramic sea views, electric/TV hook ups and superb shower facilities. Alternatively you can purchase your own holiday home or hire one of our self contained luxury caravans. 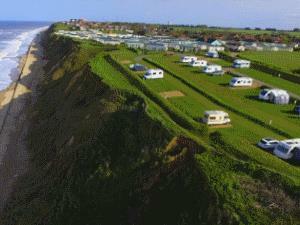 Sandy Gulls is nestled on the Cliff tops at Mundesley. It specifically caters for customers and tenants who value our tranquil location. Managed by owning family for over 35 years. Adults only touring park. All pitches have panoramic sea views from a gently sloping cliff top location. Children welcome from any age. From A149 Cromer drive south along coast road for 5 miles.